Everything Everywhere has revealed the specs for the phones to have 4G connectivity, and one just happened to be the Samsung Galaxy S3 with Jelly Bean inside. Everything Everywhere is bringing 4G to the UK under the new banner of EE and at the launch in London today it revealed the phones that will come with 4G connectivity. One of those phones is the Samsung Galaxy S3 and according to EE's spec sheet, the 4G iteration of the handset will come packing Android 4.1 Jelly Bean. 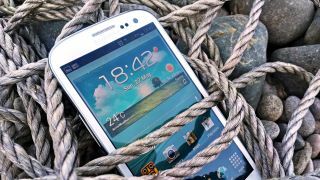 It also states that the Samsung Galaxy S3 LTE will be quad-core. This is interesting as Samsung was having problems getting the 4G technology to marry up to a quad-core chip, hence the reason the phone is dual-core in the US. TechRadar has contacted Samsung to see what the situation is on this. The specifications reveal that EE will offer the S3 in an exclusive Titanium Grey and it will come with Android 4.1. Do not fear if you already have a Samsung Galaxy S3, though, as a reader has tipped us off that he has received the update and it is currently downloading 60MB of content on to his phone. He has an international Galaxy S3 and is Germany, but at least it means that downloads are on their way. We managed to check out the Galaxy S3 LTE next to its 3G brother, see how it got on in our video below.